Section of Pathology, Dept. of Surgery, University of Pisa, Italy. * Division of Paleopathology, Dept. of Oncology, Transplants and Advanced Technologies in Medicine, University of Pisa, Italy. ° Division of Diagnostic and Interventional Radiology, Dept. of Oncology, Transplants and Advanced Technologies in Medicine, University of Pisa, Italy. °° Section of Clinical Radiology, Dept. of Clinical Physiopathology, University of Florence, Italy. The Medici were one of the most powerful families of the Italian Renaissance: starting from the 14th century, their careful management of banking ventures and skilful political actions brought them to the forefront of social and political power in Tuscany and in Florence, which was the intellectual centre of the Western world. Lovers of art and science, the Medici were patrons of famous artists and scientists, such as Michelangelo, Leonardo, Galileo and others . Medici family suffered of a lot of different pathology, well known from the archival documents: infectious diseases (smallpox, tuberculosis, malaria, syphilis), metabolic diseases (obesity, anemia, urinary stones), joint diseases (arthritis), cardiovascular diseases (arteriosclerosis), poisoning (chronic intoxications), tumours (breast cancer) and malformations (dwarfism). There are two main branches in the Medici family tree: the branch of Lorenzo the Magnificent and the branch of the Grand Dukes of Tuscany, which began with John of the Black Bands and ended with Gian Gastone, the last Grand Duke. The most important members of this impressive dynasty were buried under the vaults of the Basilica of San Lorenzo in Florence. In 2003 started the examination of 49 of the Medici burials in the Basilica: the “Medici Project” [3; 5], with the exploration of the funerary crypt of the Grand Duke Gian Gastone (1671-1737). A low raised platform running around the base of the crypt’s wall supported a large sarcophagus and many small wooden coffins, that had completely collapsed on the floor, covered by a layer of dry mould from the disastrous flood of Florence in 1966 . Contrary to all expectations, several of the burials in the small wooden coffins were fairly intact. For example, the elaborate costume of a 5 year old child, complete with shoes and silver crown, showed an excellent state of preservation. The red silk jacket with a thin collar and buttons was adorned with silver gallons and large plus-fours in the same flowery fabric. 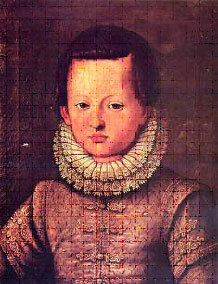 The anthropological study of this individual revealed a little boy of about 5 years, with a stature of ca 1.15 m.
The child was identified as Don Filippino (1577-1582), son of the Grand Duke Francis I, who died at the age of 5 in 1582. “Clinical history” of Don Filippino. Figure 2: Anterior view. The vault expands evenly; the facial skeleton has a normal conformation, with the exception of a relatively high mandibular symphysis. Don Filippino was the seventh son, and only male, of the Grand Duke Francis I and Joan from Austria; he was born on May the 20th 1577 and “was immediately baptized at night because, owing to his troublesome birth, there was fear for the newborn’s life”. Indeed, his delivery was long and difficult, as a result of his mother’s pelvis dystocia. Don Filippino grew up frail and sickly, with frequent indispositions and slight persistent fevers. Psychic development must have been normal, because of the age of 5 he was already able to sign his letters. These are the archive data about the child prince’s diseases: At 1 year of age he had bronchitis with fever; at 2 years “severe weakness”, “nerve attacks” and “convulsions”; at 5 years he died of “tertian” (intermittent) fever, with epilepsy, convulsions and coma. “On the 29th March Filippo, great Prince of Florence, died…he was buried in (the church of) San Lorenzo. The doctors who had cured him - both physicians and surgeons - cut his head and removed the cranial vault as if it were a bowl and found, underneath the first membrane of the brain, the equivalent of almost a glass of water, so that they all thought that this had been the real cause of his death” [9; 14]; and ”…(The doctors) opened the body of the Prince and found his head full of water..” [10; 14]. 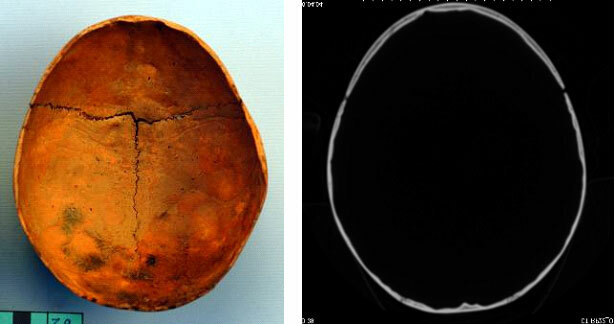 Figure 6: Expansion of the neuro-cranium, severe thinning of the cranial teca and sulcal and gyral impressions are very evident in oblique projection and high vault CT.
Paleopathology of Joan from Austria, mother of Don Filippino. Joan appears in numerous portraits; she was not very attractive and some contemporary reports even describe her as “hunchbacked”. She survived six very difficult deliveries, but died at the age of 30 during childbirth after the rupture of the uterus. The skeleton of Joan from Austria reveals a woman with anthropological age of 25-35 years and stature of 1.58 m. The weak muscular insertions suggest very limited physical activity. The paleopathological study of the skeleton reveals a true collection of disorders: Mandible prognatism; marked congenital hyperostosis (ca 1 cm) of the cranial vault; amelogenesis imperfecta of the dental crowns; incomplete congenital dislocation of the hip; severe scoliosis of the lumbar column, with impressive deformity of the pelvis (which well explains her difficult deliveries and death for rupture of uterus). The enormous retro-pubic foveae in her pubic symphysis and the deep pre-auricolar sulci bear witness to her numerous difficult deliveries [4; 6]. 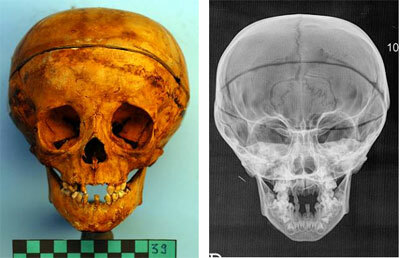 The skull of the 5 years old child reveals some important peculiarities. In anterior view a vault expanding evenly is visible; the facial skeleton has a normal conformation, with the exception of a relatively high mandibular symphysis (Figure 2). In lateral view the vault is evenly expanded and the supraorbital ridges are weakly expressed and overhung by the frontal squama; the most anterior projection of the frontal squama in the Frankfurt horizontal plane is 3 cm above the glabella; an extensive series of wormian bones intervenes between the sphenoparietal, squamosal and parieto-mastoid sutures (Figure 3). In superior view the cranial outline is ovoid; the vault is narrow anteriorly and maximally expanded at the parietal eminences; the coronal suture formation is relatively complete, but very diastased, in particular in the bregma region (Figure 4). At this proposal, it is well known that, while open cranial sutures are normal in a 3 year old child, their presence (more than 2 mm) at the age of 5 years is indicative of a developmental anomaly . In posterior view the vault is rounded superiorly, but quite flat at the sides; the left side is slightly flatter than the right; the vault tapers from the parietal eminences to the level of the mastoid processes. Internally, attachment sites for the falx cerebri and cerebelli and the tentorium cerebelli are exaggerated and sharp; the superior petrous crest and borders of the transverse sulci (tentorium cerebelli) of the occipital are extended; the endocranial surface is heavily marked by sulcal and gyral impressions, especially in the region of the parietal and occipital lobes; grooves of the branches of the middle meningeal vessels and nerves are abnormally deep and expanded (Figure 5). All the cranial theca appears very thin and translucent. In conclusion: Separation of all major sutures, shallowly impressed gyral, sulcal, and endocranial vascular grooves are some of the most important signs to make a paleopathological diagnosis of hydrocephalus [13; 15]. At radiologic examination, expansion of the neuro-cranium, severe thinning of the cranial theca and sulcal and giral impressions are very evident in oblique projection and high vault computer tomography (CT) (Figure 6; Figure 7). The thinning of the theca and marked gyral impressions are also visible, at standard X-ray and CT, in the anterior cranial fossa. Both a 3 Dimensional Computer Tomography reconstruction and a latero-lateral standard X-ray show flattening of the cranial base (platybasia) (Figure 8). Finally, we found increased cranial sizes, ranging from 1 to 4 SD (Standard Deviation) above average , and reduced or normal facial dimensions. The cranial capacity of Don Filippino, calculated with the method of Bergeroff , is 1553 cc (Table 1), while the cranial capacity of 5-year-old boy range between 1100 cc and 1400 cc . 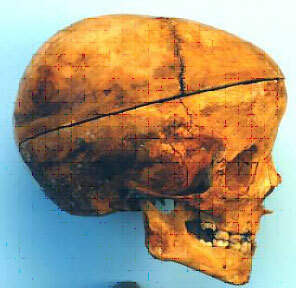 This significant enlargement of the cranial vault relative to the size of the face is perhaps the major factor in the diagnosis of hydrocephalus [1; 2; 12; 13]. Furthermore, a portrait of Don Filippino, painted in the same year of his death (1582), shows a head with low implant of the orbits and auricles and evident expansion of the cranial vault, compatible with a non-severe hydrocephaly (Figure 1). These features: enlargement of the head; thinning of the skull bones; widely separated sutures with wormian bones; atrophy of the supraorbital ridges; flattening of the cranial base are considered sufficient for a diagnosis of hydrocephaly. As further datum, the post-cranial skeleton shows evident rickets, with curvature of the left tibia and fibula (Figure 9). This is a clear case of non-severe hydrocephaly, as witnessed by the macroscopic and radiological study, and by the 16th century autopsy report which well describes an increase of water underneath “the first membrane” (obviously the aracnoid). Therefore, we are in front of a case of communicating external hydrocephaly caused by the failure in the riabsorption of the liquor, due to the leptomeningeal lesions - most probably haemorrhagic - caused by the child prince’s dystocic delivery. An external hydrocephalus can also occur as a result of a subarachnoid hemorrhage and after a severe trauma . Of course the rickets strongly contributed to worsening this pathological condition. In fact, it is well known the phenomenon that, when the newly-born child is kept in supine position, the load is mainly distributed along the back and the occiput. 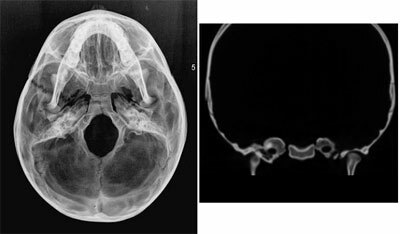 Rickets can generate a shorter antero-posterior diameter of the skull with flattening of the occipital curvature (brachycephaly) as well as floppiness of the vault (platybasia). Furthermore, the faulty calcification of the osseous matrix at the level of the sutures induces their persistence and prevents closure of the fontanelles; for example, the bregmatic fontanelle, that normally closes at 18-20 months of age, can even remain open until the age of 3 years. It follows that the skull becomes larger than normal and that a hydrocephalus can develop. These alterations can be associated - as occurred in the case of Don Filippino - with craniotabes, namely the formation of areas of thinning and rarefaction of the cranial vault due to the reabsorption of the calcified matrix under the effects of the endocranial pressure. However, the hydrocephalus of Don Filippino was not responsible for any neurological symptoms, apart from, perhaps, the “attacks of nerves” and “convulsions” reported in his clinical history. His psychic development was normal until his premature death, which was caused by an acute fever infection of unknown aetiology. Brothwell D.R. Digging up bones // New York: Cornell University Press - 1981. Derry D.E. A case of hydrocephalus in an Egyptian of the roman period // J Anat Physiol -1913 - Vol. 47 (Pt4) - P. 436-458. Fornaciari G., Brier B., Fornaciari A. Secrets of the Medici // Archaeology - 2005 - Vol. 58/4 - P. 36-41. Fornaciari G., Vitello A., Giuliani S., Giuffra V., Fornaciari A. The “Medici Project”: First results of the explorations of the Medici Tombs in Florence (15th-18th centuries) // Paleopathology Newsletter - 2006 - Vol. 133 - P. 15-22. Fornaciari G., Vitiello A., Giusiani S., Giuffra V., Fornaciari A., Villari N. The Medici Project first anthropological and paleopathological results of the exploration of the Medici tombs in Florence // Medicina nei secoli (Journal of history of medicine) – 2007 – Vol. 19 – P. 521-543. Fornaciari G, Giuffra V, Giusiani S, Fornaciari A, Marchesini M, Vitiello A., Autopsy and embalming of the Medici, Grand Dukes of Florence (16th-18th centuries) // VI World Congress on Mummy Studies, Teguise, Lanzarote, Canary Islands, Spain - 2007 - Vol. 1 - P.142-142. Krogman W.M. Growth of man // Tabulae Biolo.-1941 - Vol. 20 - P. 1-963. Kumar R. External hydrocephalus in small children // Childs Nerv Syst - 2006 - Vol. 22 - P. 1237-1241. Lapini A. Florentine Diary 1589 // Corazzini G. O., Firenze - 1900 - P. 173. Letter of the Grand Duke Francis I to his brother, the Cardinal Ferdinand (7th April 1589). Lischi G., Menichini G. Röntgencraniologia infantile // Minerva Medica - 1959 - P. 5-27; P. 320-346. Milhorat T.H. Hydrocephalus and the cerebrospinal fluid // Baltimore: Williams and Wilkins -1972. Ortner D.J. Congenital and neuromechanical abnormalities of the skeleton // Identification of pathological conditions in human skeletal remains – 2003 - Academic Press - P. 453-463. Pieraccini G. La stirpe de’ Medici di Cafaggiolo // Nardini Editore - 1986. Richards G.D. and Anton S. Craniofacial configuration and postcranial development of a hydrocephalic child (ca. 2500 B.C.-500 A.D.): with a review of cases and comment on diagnostic criteria //American Journal of Physical Anthropology - 1991 - Vol. 85 - P. 185-200. Sommi Picenardi G. Esumazione e ricognizione delle ceneri dei Principi Medicei fatta nell'anno 1857 // Archivio storico italiano serie V, tomo I, disp. III e tomo II, disp. IV - 1988. Figure 3: Lateral view. the vault is evenly expanded and the supraorbital ridges are weakly expressed and overhung by the frontal squama. The most anterior projection of the frontal squama in the Frankfurt horizontal plan is 3 cm above the glabella. An extensive series of wormian bones intervenes between the sphenoparietal, squamosal and parieto-mastoid sutures. Figure 4: Superior view. 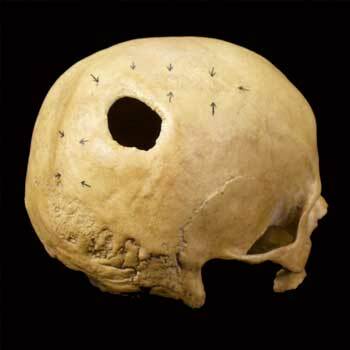 The cranial outline is ovoid; the vault is narrow anteriorly and maximally expanded at the parietal eminences. Coronal suture formation is relatively complete, but very diastased, in particular in the bregma region. Figure 5: The endocranial surface is unusually heavily marked by sulcal and gyral impressions, particularly in the region of the parietal and occipital lobes. Grooves of the branches of the middle meningeal vessels and nerves are abnormally deep and expanded. 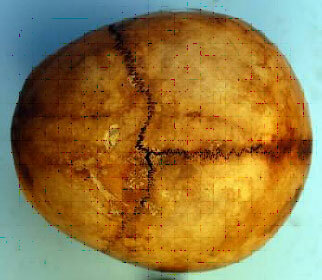 The cranial teca is very thin and translucent. Figure 7: The thinning of the teca and marked gyral impressions are also well visible, at standard X-ray and CT, in the anterior cranial fossa. Figure 8: Both a 3D CT reconstruction and a latero-lateral standard X-ray show the flattening of the cranial base (platybasia). Figure 9: The post-cranial skeleton. 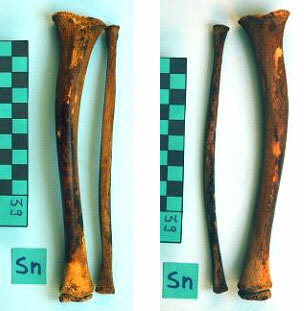 Evident rickets, with curvature of the left tibia and fibula.